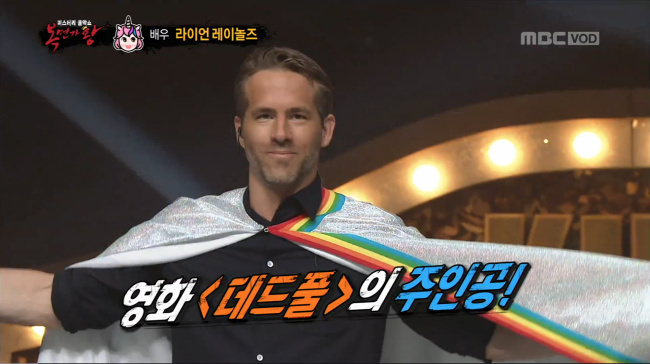 Hollywood actor Ryan Reynolds wowed Korean audiences by making a surprise appearance on MBC’s “King of Mask Singer” on Sunday. Reynolds, who visited Korea on May 1 to promote “Deadpool 2,” which opens this week, reportedly took part in the show in the middle of the movie promotions tour. Clad with a silver cape and unicorn-shaped mask, Reynolds sang “Tomorrow” from the “Annie” musical. Not knowing who was behind the mask, the panel of the show expected he would be either local TV personality Robert Holley or Hollywood actor Jake Gyllenhaal. Comedian and panel member Lee Yoon-suk guessed the mystery singer might be US President Donald Trump. As the singer took off the mask, the panel members and audience screamed in shock. His unexpected appearance instantly set social media on fire, sending the name “Ryan Reynolds” to the top of major search engines’ trending bars. “Oh my god, Ryan Reynolds is on ‘King of Mask Singer,’” a Twitter user wrote, sharing footage of Reynolds taking off the mask. The post soon garnered over 11,000 likes and was retweeted over 30,000 times on the social media platform. “I still can’t believe it. Reynolds‘s promotion schedule in Korea is just amazing,” another Twitter user said, receiving over 2,000 likes in a day. Reynolds also remarked that the unicorn mask was “much easier to wear” than the Deadpool mask. A video of the interview was shared over 11,800 times via Twitter. “I am lost for words. It’s shocking, but I love it!” a Twitter user wrote in the caption.